Object ............................................ M 29 - " NGC 6913 "
Target details ......................... Messier 29 (also known as M 29 or NGC 6913) is an open cluster in the Cygnus constellation. It was discovered by Charles Messier in 1764, and can be seen from Earth by using binoculars. 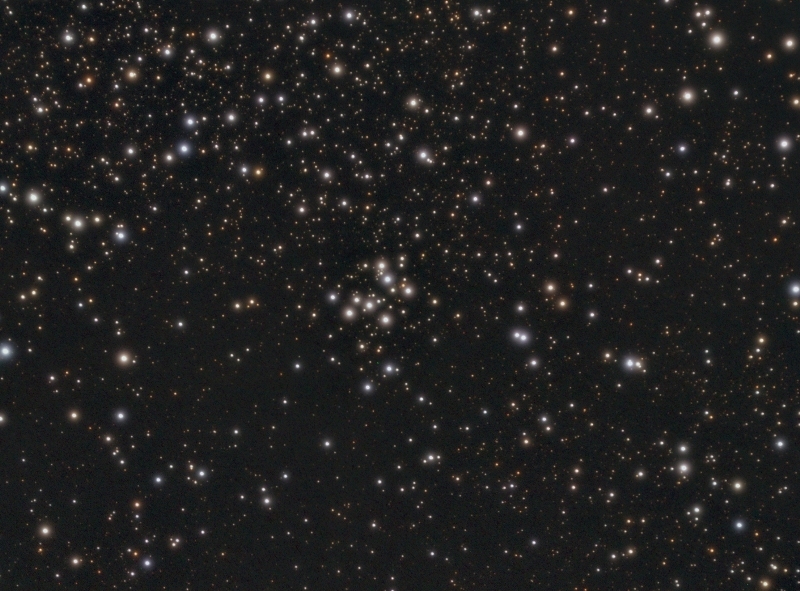 M29 is a rather coarse and less impressive cluster, situated in the highly crowded area of Milky Way near Gamma Cygni, at a distance of 7,200 (most sources including Mallas/Kreimer and Burnham, and agreeing with early estimates or R.J. Trumpler 1930) or 4,000 light years (the latter from Kenneth Glyn Jones and the Sky Catalogue 2000.0). The Night Sky Observer's Guide by Kepple and Sanner gives a deviating value of 6,000 light years - the uncertainty due to inaccurately known absorption of the cluster's light. This cluster can be seen in binoculars. In telescopes, lowest powers are best. The brightest stars of M29 form a "stubby dipper", as Mallas says it. The four brightest stars form a quadrilateral, and another three, a triangle north of them. A few fainter stars are around them, but the cluster appears quite isolated, especially in smaller telescopes. In photographs, a large number of very faint Milky Way background stars shows up. M29 can be found quite easily as it is about 1.7 degrees South and little East of Gamma or 37 Cygni (Sadr). 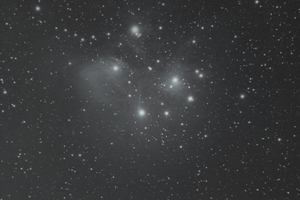 In the vicinity of M29, there is some diffuse nebulosity which can be detected in photographs.